Humans have been using pesticides for many thousands of years, with one of the first instances being around 1000 BC when the Chinese used sulfur to control bacteria and mould. Organic and inorganic compounds continued to be used as pesticides for many years, however synthetic chemistry saw rapid advancement in the 1930s, leading to the creation of a whole new class of chemical pesticides and insecticides. These chemicals were originally developed as chemical warfare agents, however post World War II they became widely used in agriculture, without much thought into the potential side effects. Fast forward to the 21st century and pesticides are still widely used, despite the fact that we are more aware than ever of their adverse effects. In this blog we explain how pesticides work, their environmental and health impacts, and safer alternatives. A pesticide can be classified as any substance (or combination of substances) used to destroy or suppress a pest or group of pests. These substances can be naturally derived or synthetically produced, or can be an organism such as bacteria. Pesticides can work in a variety of ways, including directly destroying/killing the pest, inhibiting its growth, or making the protected organism resistant to pests through preservatives or even genetic modifications. These widely varied substances have a variety of applications; however, they are most commonly used in agriculture. Pesticides include: algaecides, herbicides, insecticides, fungicides, rodenticides, disinfectants, antimicrobials, termiticides, molluscicides, avicides, various repellents and sanitisers. Why are they so harmful to the environment? Although pesticides exist to serve a function, and can have many benefits (including improved crop/livestock yields and quality, controlling invasive species, especially harmful disease vectors, and minimising obstruction to human activity) they are not without serious side effects. Chemical pesticides easily spread to surrounding areas through the atmosphere, the soil and through waterways, contaminating much more than the crops they were originally intended for. Pesticides can disrupt fragile ecosystems, harming essential microorganisms and often killing animals that play important roles as predators and pollinators. In addition to killing or sickening surrounding wildlife, pesticides can also be detrimental to human health. 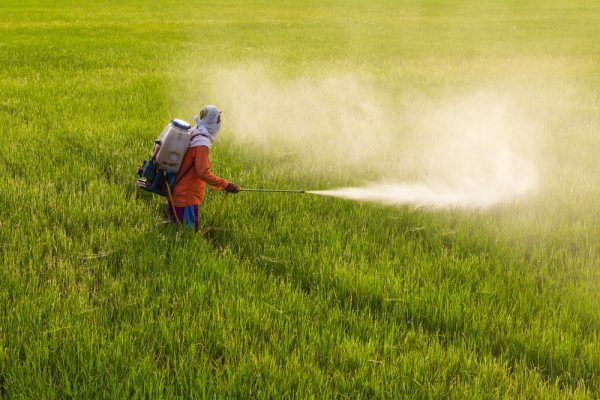 Pesticides are associated with health risks such as skin and eye irritation, central nervous system diseases, reproductive issues and even some forms of cancer. Pesticides are also thought to lower the nutritional value of treated fruits and vegetables. There are a range of environmentally friendly alternatives to pesticides including reproductive controls, crop rotation, organic farming, polyculture, trap crops (luring pests away from valuable crops), pheromones and quarantine. Obviously these solutions won’t be applicable for every situation, however it’s encouraging to know there are other options. If you’re concerned a worksite or environmental area may be contaminated with residual pesticide, Alpha Environmental can help. Alpha Environmental are trusted environmental consultants in Melbourne, offering a range of services including soil assessment and groundwater assessment. To enquire about our capabilities, simply call us on 1300 039 181.